"Kid, you take life way too seriosly." — Red X to Robin, Teen Titans, "X"
"I'll tell you my story so you can understand it, with a beginning, middle, and end... We'll start in the middle." User: JJ42 joined Biosector01 in mid August 2009, although his original page was deleted on October 7th he still works on Biosector01, he has completed over 100 edits, and prides himself on having the first user page that appears in the drop down menu when you type "User:J" in the search bar. His user page was acsessed over 1,700 times. JJ42 has been a fan of Bionicle since the "Tohunga" Happy Meals of 2001, he is also a fan of Ben10, Digimon, and Doctor Who. JJ42's page was accidentally deleted (again) due to a misunderstanding on October 29, 2010 but returned on November 6, the new page has recieved over 4,700 views. In his spare time JJ42 is a proffesional gambler, samuria and saxaphone player - his mother's maiden name is not Jones. Warning the following is not part of the BIONICLE canon in any way. Bionicle Avatar: JJ42 was originally a Toa of Air, but in an encounter with the Energized Protodermis Entity he was mutated into a form identicle to Toa Lewa in pilot mode. JJ42 then became a bounty hunter, and is currently employed by the Order of Mata Nui to track down villians that have escaped from the Matoran Universe. Weapons: Usually a Combat Staff, Wrist Blades, Impact Crystal Launcher, or a Kanoka Launcer armed with stun disks. "I thought you didn't play the hero?" "Doesn't mean I don't know how." — Robin and Red X, Teen Titans, "X"
Trivia:This is JJ42's strongest form, he once destroyed a Makuta by using it. Trivia:Allthough JJ42 may resemble a Skakdi in this form, he is still a mutant Toa. Powers:Moderate strength, Can fire energy bolts, sludge, sleeping gas, and electric webs from his claw. Trivia:JJ42 once battled the Dark Hunter Gladiator using this form on Stelt... And won. "Because I remember what happened the last time we went left." "It's the mask--it lets me do things others can't." "And here I thought Toa just wore masks to hide their ugly faces." Versus Match! Umbra fighting Darkness! Digimon of the world unite! Taken from the Digimon Next comics Chapter 24. "Well all the jokes can't be good - You've got to expect that once in a while." "'Place of far seeing'? Your Turaga speaks in riddles... I hate riddles." "Our world... Our people were once as pure and strong as ice Then... Makuta came, bringing evil to this land." "By choice, or just 'cause no one can stand you?" "You should be more careful Gali. Nextime, I might not be here to save you." "The mask of speed is underwater. How incredibly... annoying." "Something doesn't want me to find this mask. Well, "Something" is going to be very dissapointed." "So, the Toa now work together...? Then they can fall together as well." "What is happening I thought we finished our quest?" "Victory might have been an illusion Lewa." "History says ther's safety in numbers. Let's split into three teams to find the great disks.[...]" "Good thought-plan! Of course you got the idea from me..."
— Whenua and Matau, Comic 16: Toa Metru! "Umm.. I think we need more Toa..."
"Nuju! Onewa! Bring the building down!" "About time we had some action around here." "No Morbuzahk. you have had your last season. The time of harvest has come." "How much do you want to bet the big, ugly creeps with bat wings are the bad guys?" "What tipped you off? The fact that they're shooting at us?" "Don't worry. We've faced worse things than a few Makuta... Though I don't remember when." "Another plunge underground... I'm starting to think the Great Spirit likes Onua best." "Rides over Antroz. Everyone out!" "I don't think he's listening - let's pound it into him." "Nothing is more important to me than being a glatorian. Don't try to get in my way. I don't like hurting the elderly." "Put your hand on me again and you'll be a one-armed glatorian." "Your're only a prime glatorian out of respect for your past. Well the past is dead and I'm the future." "Then talk just stay clear of my sword." "I don't like Vastus and the rest more than you do. But I have to admit, knowing they're all rooting for me this time feels good." "Good. Then they can visit your grave." "Vorox don't know how to lie, or decieve, or fake defeat to trick an opponent. He will have much to teach them, Malum Knows, once the tribe is his to command." "Tahu, Toa of Fire. Onua, Toa of Earth. Gali, Toa of Water. Lewa, Toa of Air. Pohatu, Toa of Stone. And Kopaka, Toa of Ice. Great warriors with great power, drawn from the very elements themselves. Together, they were six heroes with one destiny: to defeat Makuta and save Mata Nui." Consisted of two random Kanohi masks and a Toa head piece. Included instructions to combine all six sets into a "Turaga Nui", which is not included in the canon storyline. Included instructions to combine sets into two Toa Kaita: Pohatu, Onua, and Tahu into Akamai; and Gali, Lewa, and Kopaka into Wairuha. Early releases of Toa included mini CD-ROMs with content about the Toa. 8537 Nui-Rama Included instructions to build a Nui-Kopen. 8538 Muaka & Kane-Ra Included instructions to build a Kuma-Nui. 8539 Manas Included instructions to build a Mana Ko. 8548 Nui-Jaga Included instructions to build a Kahu bird. 8549 Tarakava Included instructions to build a Tarakava Nui. All sets, save the manas, could be combined into a Rahi Nui, though instruction were never shown. Consisted of a three-track music CD, a chrome silver "Kanohi Rua" (shaped like a Kanohi Hau), and the Matoran, Hafu. "Tohunga" were distributed as part of a McDonald's Happy Meal promotion in Fall 2001. ("Tohunga" were later renamed "Matoran"). Included instructions to combine sets into two Tohunga Kaita: Huki, Onepu, and Jala into one; and Maku, Kongu, and Matoro into another, neither of which is included in the canon storyline. Included instructions to combine all six sets into a "Tohunga Nui". "Turaga Kabaya" were distributed along with Kabaya sweets packages in Japan during late 2001. Included instructions to combine all four sets into a "Turaga Kaita". Visitors to Legoland could receive a free translucent green Kanohi Miru. Those at European Legolands could also buy copper-colored Noble Huna and Noble Komau. Toys "R" Us had a promotion distributing copper-colored Noble Huna masks. "It is said that the Bohrok sleep an eternal sleep, waiting to hatch. Once awakened, the swarms are unstoppable... a force so powerful, they can reduce mountains to rubble and turn life-giving rivers dry as the desert sands!" Consisted of three random Krana and two random gold- or silver-colored Kanohi Masks. Included instructions for two alternate models: one combining Gahlok Va, Kohrak Va, and Lehvak Va; the other combining Pahrak Va, Tahnok Va, and Nuhvok Va. Whether these "Bohrok Va Kaita" are canonical is unknown. Included instructions for two Bohrok Kaita: one combining Pahrak, Nuhvok, and Tahnok; the other combining Gahlok, Lehvak, and Kohrak. Though neither have been seen in-story, both are considered canonical. 8556 Boxor Included the Matoran, Nuparu. Included instructions for an alternate model, which is not included in storyline canon. 8557 Exo-Toa Included instructions for an alternate model (unofficially called "Exo Raptor"), which is not included in storyline canon. 8558 Cahdok & Gahdok Included instructions for an alternate model (unofficially called "Bahrag Spider"), which is not included in storyline canon. "Bohrok Va Kabaya" were distributed along with Kabaya sweets packages in Japan during 2002. Included instructions to combine all four sets into a "Bohrok Va Kaita". Orange Kanohi Vahi became available in various places, including a mail-in Walgreen's promotion in June. 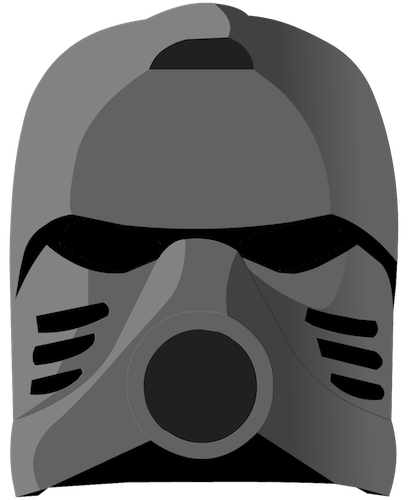 Consisted of two random Kanohi Nuva masks and three random Krana. European release was item number 8597, "Krana Nuva". Included instructions to combine sets into two Toa Kaita Nuva: Onua, Pohatu, and Tahu into Akamai Nuva; and Lewa, Gali, and Kopaka into Wairuha Nuva. Consisted of instructions and parts for the following Rahi models: Hikaki dragon-lizard, Vako rhinoceros, Kuna(or Bog Snake), Hoi(or Shore Turtle), Hoto beetle, Takea shark, Ruki fish, Ussal crab, Kewa bird, Taku fishing bird, Fikou spider, Makika cave toad, Fusa kangaroo, Husi ostrich and Kofo-Jaga scorpion. "This is the Great Kanohi Mask of Light. A mask to be worn only... by the Seventh Toa, a Toa of Light." Consisted of two random Kanohi Nuva masks and three random Krana-Kal. European release was in a plastic bag instead of a cardboard box, and item number 8600. The Bohrok-Kal were not officially released in Australia, but the Australian department store chain Big W shipped them in around the end of 2003. Included instructions to combine sets into two Bohrok-Kal Kaita: one combining Nuhvok-Kal, Tahnok-Kal, and Pahrak-Kal; the other combining Kohrak-Kal, Lehvak-Kal, and Gahlok-Kal. Early Bohrok-Kal releases included mini CD-ROMs with content about the Bohrok-Kal and Toa Nuva. Random Bohrok-Kal sets included rare silver Krana Xa-Kal: 5,000 made of white metal and 72 of actual sterling silver. They were only available in North America and the United Kingdom. 8580 Kraata Consisted of three random Kraata and two stickers. Included instructions to combine all six sets into two "Matoran Kaita", neither of which are included in the canon storyline. Included instructions to combine sets into two Rahkshi Kaita: one combining Panrahk, Guurahk, and Vorahk; the other combining Kurahk, Lerahk, and Turahk. These are canon and were the villains in the comic "Secrets and Shadows". Early Rahkshi releases included mini CD-ROMs with content about the Rahkshi and Toa Takanuva. Included instructions to combine sets into an alternate form of Makuta called "Makuta Nui", which is not included in the canon storyline; this model is often mislabeled as an Ash Bear. Included an Ussanui vehicle and a sparkly clear Kanohi Avohkii mask. Also included instructions to combine with the Makuta set into Takutanuva. Exclusive to Toys-R-Us stores. Consisted of Makuta and Takanuva sets, plus a movie-edition Kanohi Kraahkan mask. Fikou sets were released with the purchase of any Bohrok-Kal in Belgium. Late Rahkshi releases at Target stores included purple Shadow Kraata. Red-and-green "Poisoned" Hau Nuva masks were distributed in various promotionals; in the US at LEGO Brand Store openings in November. Blockbuster stores sold combination packs (65295, 65296, 65297), each containing two box sets and a gold Kanohi Avohkii mask. Consisted of two random Kanoka Disks and a Kanoka Launcher. Included instructions to combine sets into two Rahi: Nuhrii, Ahkmou, and Orkahm into a Kinloka; and Vhisola, Tehutti, and Ehrye into a Kavinika. Included instructions for two alternate models: Vakama, Matau, and Onewa into a Kralhi; and Nokama, Whenua, and Nuju into a Kraawa. In the BIONICLE Adventures 3: The Darkness Below, there were additional instructions included to combine all six Toa Metru into the Rahi Krahka. Early European Toa Metru releases included mini CD-ROMs with games featuring the Toa Metru. (North American releases included "Kanoka Cards" which included codes that could be redeemed at Bionicle.com for the same CD content.) Any two Toa Metru Canister Lids can be combined into a Matoran Sphere. In Australia during Autumn 2004 the six Toa Metru were available in a co-pack along with Tahu Nuva. 8711 Master Accessory Kit Exclusive to Toys "R" Us Stores in the USA. 8713 Limited Edition Accessory Kit Exclusive to Toys "R" Us Stores in the UK. 3259 Disk Launcher + Kanoka Disk Released in France along with a BIONICLE Comic Book. 8026 Kraatu Lunchables also distributed three miniature comic books inside select meals. Included instructions to combine sets into two specialized Vahki models: Nuurakh, Vorzakh, and Rorzakh into a Kranua; Bordakh, Zadakh, and Keerakh into a Kraahu. Late Vahki releases exclusive to Target Stores in the USA included a Flat Dark Gold Kanohi Vahi and a Kanoka Disk of Time as part of a special promotion. All Vahki came with 'kanoka cards' which were redeemable for points on bionicle.com. Included instructions to combine all three sets into "Ultimate Dume". More instructions were later distributed through Lego Club Magazine to combine Turaga Dume and Nivawk with Nidhiki into a Lohrak. Exclusive to Toys "R" Us Stores. Consisted of Turaga Dume and Nivawk, Nidhiki, and Krekka sets; plus a special Kanohi Kraahkan mask designed to fit the model. "No one knows where the Visorak came from or why. Those few who have mastered their language claim that Visorak means 'stealers of life' and others say it means 'poisonous scourge.' Either way, no truer words have been spoken. Fear them, for they are a plague upon the land, leaving nothing but pain and fear behind them. " Consisted of four randomly-colored marbled Rhotuka Spinners and one pearl light grey one. Included instructions to combine sets into two Rahi: Gaaki, Pouks, and Kualus into an Ice Vermin; and Norik, Bomonga, and Iruini into a Colony Drone. In Europe, the Visorak were released in Winter 2005 instead of the Toa Hordika. Included instructions to combine sets into three Rahi: Vakama and Whenua into a Cable Crawler; Nokama and Nuju into a Sea Spider, and Onewa and Matau into a Rock Raptor. More instructions were later distributed through Bionicle.com to combine sets into two more Rahi: Vakama, Whenua, and Matau into a Protocairn; and Nokama, Onewa, and Nuju into a Frostelus. 6637 Ultimate Battle Set Exclusive to Toys "R" Us Stores in Germany and Austria. 8715 Ultimate Creatures Accessory Set Exclusive to Toys "R" Us Stores in the USA. In Europe, the Toa Hordika were released in Summer 2005 instead of the Visorak. Included instructions for three alternate sets: Vohtarak and Oohnorak into a Gate Guardian; Boggarak and Suukorak into a Kahgarak, and Roporak and Keelerak into a Chute Lurker. More instructions were later distributed through Bionicle.com and Lego Club Magazine to combine sets into three more Rahi: Vohtarak, Oohnorak, and Keelerak into a Parakrekk; Boggarak, Roporak, and Suukorak into a Venom Flyer; and all six sets into a Zivon. Norik and Iruini in Toa Hagah form were released in Europe in Winter 2005. Toa Norik in the USA was exclusive to Wal-Mart Stores as part of a "Special Edition Guardian Toa Bonus Pack" that included Toa Iruini as well. Keetongu, Sidorak, and Roodaka were released in Europe in Winter 2005. Included instructions to combine sets into two Dark Hunters: Keetongu and Roodaka into The Shadowed One, and Keetongu and Sidorak into Sentrakh. More instructions were later released through Voporak sets (below) and later still at Lego.com to combine all three Titans into Voporak. Exclusive to Target Stores in the USA. Consisted of Keetongu, Sidorak, and Roodaka sets, plus instructions to combine all three into Voporak. Exclusive to Toys "R" Us Stores in the USA. Tower of Toa came with a gold Kanohi kraahkan with two holes filled in, as in 2008's Icarax, though this one was not considered a Kraahkan in the storyline, more of a golden growth on the miniature Kahgarak included. "They will brave the lightning ... they will walk through the fire ... they will stare into the eyes of evil ... and if they waver even once, they will die." Includes instructions to combine sets into two Rahi: Velika, Piruk, and Balta into a Lava Hawk; and Kazi, Garan, and Dalu into a Dagger Spider. Includes instructions for three alternate models: one combining Reidak and Zaktan, another combining Hakann and Avak, and a third combining Vezok and Thok. None of these are included in storyline canon. More instructions were later distributed through Irnakk sets (below) and Lego Club Magazine to combine sets into two more alternate models: Reidak, Vezok, and Thok sets into Irnakk; and Hakann, Zaktan, and Avak sets into a Protodax. Consists of Reidak, Vezok, and Thok sets; plus instructions for Irnakk, a gold Thok spine piece, and some gold tubing. Instructions were later distributed through Bionicle.com to combine Hahli, Nuparu and Hewkii into Toa Jovan. Instructions were distributed through Bionicle.com to combine Axonn and Brutaka into Botar. Axonn and Brutaka were released in Europe in Winter 2006. Instructions were later released through Vezon & Kardas sets (below) to combine all three Titans into Vezon and Kardas. 8625 Umbra Exclusive to Wal-Mart Stores in the USA. 10204 Vezon & Kardas Exclusive to Target Stores in the USA. Consists of parts for Axonn, Brutaka, and Vezon & Fenrakk sets but only includes instructions for Vezon & Kardas; not for any of the other Titans. The final of the four however is non-canon. These pack contained 10 gold, gunmetal and silver Zamor Spheres in a random three-three-four color combination. "They call themselves Barraki--it's a Matoran word meaning "Warlord." They dwell in the depths of a strange sea, a place only the very brave or the very foolish would ever dare to go." Instructions were released through Lego BrickMaster Magazine to combine Carapar, Mantax, and Ehlek into a Pit War Tortoise; and Takadox, Kalmah, and Pridak into a Zyglak. Exclusive to Wal-Mart Stores in the USA and certain UK stores. In the UK, Nocturn was included in a co-pack with Dekar and Thulox that was exclusive to Tesco Stores. The "collectible" for the following sets are Cordak Blaster, though Cordak ammo is not available separately. 8911 Toa Mahri Jaller Jaller Mahri includes a Hahnah Crab. You can attach this to his back. However, in order to do so, it needs some special attachments and adjustments. Instructions were distributed through Lego Club Magazine to combine Toa Mahri Nuparu, Toa Mahri Matoro, Barraki Carapar, and Barraki Mantax into a Manutri. Each Toa Mahri's Canister could be converted into a battle station that the Cordak Blaster could be mounted upon. Includes a Sea Sled. Exclusive to Wal-Mart Stores in the USA and Tesco stores in the UK. Includes two Matoran named Sarda & Idris, as well as an undersea trap. Exclusive to Toys R Us stores in the US and the now-defunct Woolworths stores in the UK. The first of the three however is the only canon playset. "When their vision cleared, they were in mid-air, high above a strange Matoran village. [...]- all around them a battle raged in the skys." 8944 Tanma Combine with Lewa or Gali. 8945 Solek Combine with Kopaka or Tahu. 8946 Photok Combine with Pohatu or Onua. 8947 Radiak Combine with Antroz or Gorast. 8948 Gavla Combine with Vamprah or Bitil. 8949 Kirop Combine with Chirox or Krika. Instructions were later distributed through Bionicle.com to combine Lewa Nuva, Antroz, Tanma, and Radiak into Makuta Spiriah. You can use the Phantoka containers as a decorative screen for the Phantoka to be displayed in. 8697 Toa Ignika Comes with Skyboard Instructions were distributed through Lego Club Magazine to combine Toa Ignika with Pohatu Nuva and Vamprah into a Niazesk. 8953 Makuta Icarax A Toys R Us Exclusive in the USA Came with a redesigned Kanohi Kraahkan that had 4 slits in place of the original 6, but otherwise identical to the one released in the Makuta Set. 20005 Klakk Released in September-October Brickmaster in a Phantoka coverage. 8690 Toa Onua New Adaptive Armor Mistika Form Combine with Photok Instructions were later distributed through Bionicle.com to combine Onua, Gali, and Tahu into Trinuma. Instructions were distributed in 2009 to make the "Swamp Stalker" using parts from all of the Makuta Mistika. 8954 Mazeka Comes with Swamp Strider Exclusive to Wal-Mart stores in the USA and Woolworth's stores in the UK. 8942-1 Jetrax T6 Comes with Antroz - Pilot Form Instructions for an alternate model of Jetrax T6 called the Destral Cycle, as seen in the November-December 2008 Issue of LEGO Magazine, were later distributed through Bionicle.com. 8942-2 Super Charged Jetrax T6 Yellow Recolor of Set 8942-1. "The harsh desert world of Bara Magna. In scattered villages, Agori deal with the daily struggle to survive. When villages have a dispute, they settle it with battles between Glatorian fighters in their arenas." In the March-April Brickmaster Magazine,instructions to make a Sand Stalker out of Malum and Fero & Skirmix sets were released. Released in September-October LEGO Brickmaster. This is only available through BrickMaster subscription and as a HMV exclusive with the BIONICLE: The Legend Reborn film in the United Kingdom. 8996 Skopio XV-1 Comes with Telluris Can transform into a tank mode. "The balance of power has shifted"
— Magnamon, Digimon Adventures 02, "The Darkness Before Dawn"
All other "Stars" come with a golden BIONICLE piece that can be placed on Tahu to create the "Golden Bionicle". 7116 Tahu Includes golden Kanohi Hau. 7117 Gresh Includes Golden Armor piece. 7135 Takanuva Includes golden armor piece. 7136 Skrall Includes golden sword pommel piece. 7137 Piraka Includes golden armor piece. 7138 Rahkshi Includes golden shield piece. This page was last edited on 30 March 2013, at 18:44.